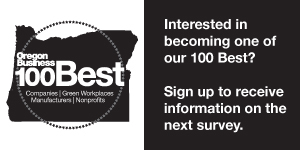 If your company made this year's 100 Best Nonprofits to Work For in Oregon list, share your achievement with customers, clients and employees with 100 Best Nonprofits trophies, window clings and other branded merchandise. Mark your success as a 2018 100 Best Nonprofit with an engraved acrylic trophy. The trophy will have the 100 Best Nonprofits logo and your company's name. Twelve window clings are included free with your order. Price: $3 each or $30 per dozen. Please enter your company name as you would like it to appear on your trophy.